New to the MLS, Los Angeles FC (LAFC) has caused quite the stir in California. The team played and won its first Major League Soccer (MLS) game in 2018 against Seattle Sounders FC. Los Angeles FC who are known as The Black and Gold competes in the MLS as part of the Western Conference. Their home ground is the Banc of California Stadium in the Exposition Park neighbourhood in L.A. The team’s head coach in Bob Bradley. Let’s take a look at The Black and Gold, the latest club to join the major leagues. Founded in 2014, Los Angeles FC was awarded by the MLS as a new expansion team to the Los Angeles area. They were introduced as the replacement to the disbanded Chivas USA team which had happened three days earlier. LAFC signed its first official player – Carlos Vela – in 2017. In a surprising turn of events, Los Angeles FC won its very first MLS game against Seattle Sounders FC. 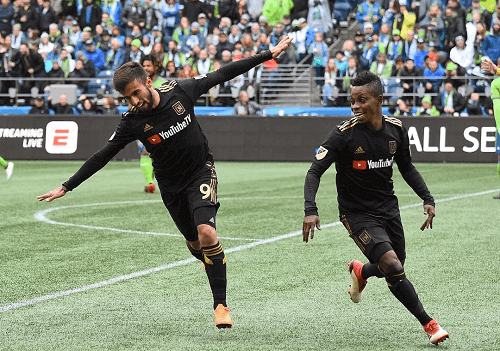 Overall, even though they had some losses, Los Angeles FC went on to become the first team in the MLS to earn 12 points from a season opening road trip of six games or more. It seems like LAFC involved its fans in every decision from the team colors, the crest, and right down to their home stadium’s design. Collectively, supporters of Los Angeles FC are “The 3252” which references both the number of seats in the safe standing section along with the sum of the numbers totalling 12 – the supporters are the team’s 12th man. There are several other supporter groups affiliate with The 3252. Their nickname – The Black and Gold – is in reference to their uniform colors. LAFC’s home kit is black and gold, while their away colours are white and gold. There is an intense rivalry between Los Angeles FC and LA Galaxy. This is due to them sharing the Los Angeles area market. Are known as El Trafico, which means “the traffic” in Spanish. It’s in reference to the notorious LA traffic, which is among the worst in America and around the world. As mentioned previously, LAFC performed very well in their opening season of the MLS. Currently in 2018, in the Western Conference, they stand at number three. They failed to make it past the knockout round. In 2018, their overall standing is at 5th place. Los Angeles FC is one team in the MLS to be on the look out for. Having achieved so much just shy of lifting the actual trophy itself, they have a promising future in the MLS.